Nepal: "The earthquakes took us by surprise, the rains should not"
One month after the first earthquake shook Nepal, and only a few weeks before the monsoon rains start, Médecins Sans Frontières / Doctors Without Borders (MSF) is racing against time to reach remote villages with medical supplies and shelter material. Difficult logistics and terrain have limited transport options, meaning MSF teams have to use helicopters to transport these materials to villages north and east of Kathmandu every day. Once the rains begin, it will be harder to reach remote areas, where the roads have been damaged, and where, as a result, people have been made more vulnerable. When the 7.8 magnitude earthquake struck Nepal, with its epicentre in Gorkha district, 80 kilometres west of Kathmandu, MSF launched activities aimed at helping affected populations in need. MSF ran mobile clinics and supplied shelter and hygiene kits. In some villages, teams found houses and health facilities totally destroyed, prompting MSF to provide the people with medical, shelter and hygiene materials. In Arughat, in Gorkha district, where the main health facility was destroyed, MSF set up an inflatable hospital. This continues to provide healthcare services to surrounding communities. On 12 May, when the second quake hit to the east of Kathmandu, MSF was able to respond immediately as teams were already on the ground. Medical teams treated people on the spot and evacuated patients with serious injuries from remote villages (click here to watch a patient evacuation). MSF continues to respond to the needs that arose from the first and the second earthquakes in different districts, giving priority to vulnerable populations in remote, hard-to-reach areas. Providing tents, tarpaulins, and construction material comprises the main focus of MSF’s intervention at this stage of the emergency. There is a need to ensure that people have a place to stay before the monsoon rains begin. The MSF teams have increased the number of trips by helicopter to reach as many people in the affected areas with shelter material. The ‘sling method’ is being used to transport large amounts of cargo (click here to watch a video of a sling operation). MSF is providing critical medical care is distributing shelter and hygiene materials across Nepal to affected communities in dire need. Where roads are accessible, MSF is using cars and lorries to distribute shelter and hygiene kits. To date, MSF has distributed shelter kits to over 10,000 households in remote villages. These distributions are ongoing with priority being given to the most isolated villages. Before every intervention, MSF conducts assessments in affected areas to establish the needs. Assessment teams are comprised of a medical team that examines patients on the ground, treats those they can and evacuates those with serious injuries. After the earthquakes, MSF teams treated people with injuries related to the earthquake and others that were not. MSF teams have conducted over 3,000 medical consultations. Teams also found people who were on the verge of dying and evacuated them immediately. A total of 1150 health facilities have been completely or partially damaged in 14 highly affected districts. The current health need is management of post trauma injuries, restoration of disrupted primary health care services and rehabilitation support to patients who are discharged from hospitals. 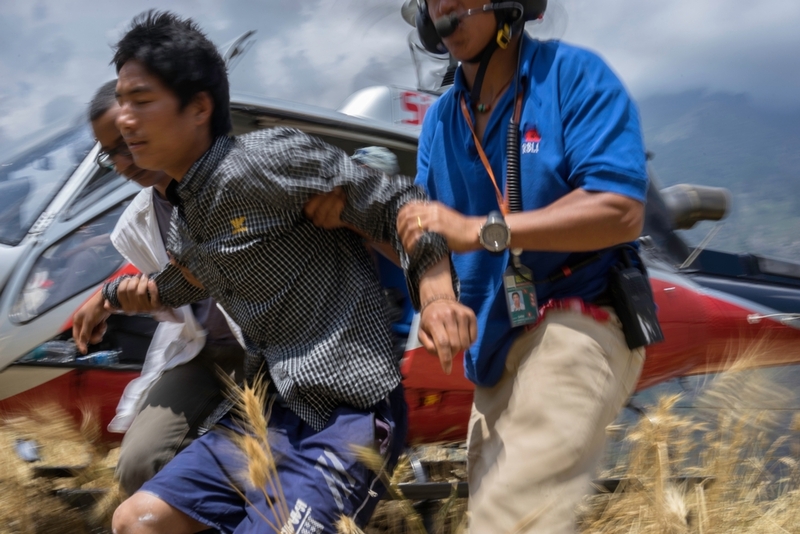 Nepal: "The window of opportunity to reach people in these areas is rapidly closing"